Beijing/Singapore: Exporters in emerging markets are hoarding dollars as losses on currency bets worsen the slump in the South Korean won, Brazilian real, Mexican peso and India’s rupee. 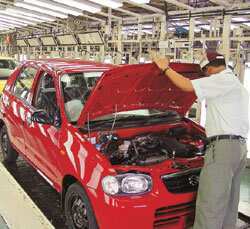 India’s biggest car maker, Maruti Suzuki India Ltd, plans to wait for a weaker rupee before bringing profits home from outside the country. Western Asset Management Co. and Union Investment, which manage more than $800 billion combined, are selling emerging-market currencies as the global economy slows and demand for dollars increases. Zurich-based UBS AG predicts the rupee will weaken 2.2% to a record low of 50 per dollar by March, adding to a 19% drop this year, while the won will depreciate 6% to 1,400, extending a 29% slump. “This is all caught up in the broader trend for the global grab for dollars," said Edwin Gutierrez, a money manager who oversees $5.5 billion in debt in London at Aberdeen Asset Management, the Scottish fund company focused on emerging markets. “Expect more weakness." The won slumped 9.7% on 16 October, the most since the International Monetary Fund (IMF) bailed the nation out in 1997. It has gained 5% in the past two days to 1,312 as the government mapped out a plan to support banks. The Brazilian real closed at 2.1190 on 17 October, bringing its 2008 drop to 16%. Mexico’s peso ended the week at 12.88 per dollar, for a year-to-date decline of 15%. India’s rupee fell for a 10th week. Emerging markets tumbled after Lehman Brothers Holdings Inc. filed for bankruptcy, deepening a freeze in credit markets. Investors turned to the safest, dollar-denominated securities even though the US economy is growing more slowly than those of developing nations and the Federal Reserve’s 0.5% benchmark interest rate compares with 5% in South Korea and 13.75% in Brazil. India cut its policy rate by 1 percentage point to 8% on Monday. The ICE futures exchange’s Dollar Index, which tracks the greenback against the currencies of six US trading partners, climbed 14% since June to 82.41, after falling 5.5% in the first half of the year. Rapid moves in exchange rates are perilous for exporters because they can’t adjust their hedging strategies fast enough. The JPMorgan Emerging Market Volatility Index soared to a record 32.01% on 10 October before ending the week at 25.63. The index never exceeded 15.66 until Lehman’s bankruptcy, according to Bloomberg data. “It doesn’t matter what your fundamentals are," said Sergey Dergachev, a money manager at Union Investment in Frankfurt, which has $233 billion in assets. “Investors are trying to get rid of anything that is associated with market risk." Central banks and governments around the world are pumping unprecedented amounts of cash into the financial system to combat the credit crisis. The moves are starting to bring down money market interest rates, which may revive demand for higher-yielding assets such as emerging-market currencies. The three-month London inter-bank offered rate for dollars fell every day last week, to 4.42% from 4.82%. The Dow Jones Industrial Average climbed 4.8% for its best weekly performance since 2003. South Korea’s government on Saturday announced it will grant a three-year guarantee for as much as $100 billion in debts used by the nation’s lenders until 30 June. Brazilian losses on currency derivatives may reach 60 billion reals ($27 billion), said Paulo Vieira da Cunha, a partner at New York-based hedge fund Tandem Global Partners. South Korean companies may lose as much as 3 trillion won ($2.2 billion) on contracts that are only profitable when the currency remains in a narrow range, said Kwon Jae Min, a credit analyst at Standard and Poor’s (S&P) in Hong Kong. “We are making up for currency losses with dollars from overseas sales," Lee Jeong Dae, head of the Hwaseong-based KJ Pretech’s finance team, said on 14 October by phone. “For now, it’s manageable but we’re at a loss how to get it through should export orders fall." Mumbai-based Sundaram Multi Pap Ltd, which makes school notebooks, is one of 12 companies that filed lawsuits against banks accusing them of hiding risks on the currency products they marketed. Mexico City-based Controladora Comercial Mexicana SAB de C, the country’s third largest supermarket chain, filed for bankruptcy last week because of losses linked to the peso’s drop. “The unwinding of these bad trades is causing all types of problems," Tony Volpon, chief economist at Sao Paulo-based brokerage CM Capital Markets, wrote in a note to investors last week. The banks that sold the trades also “hedged themselves", exposing them to similar funding calls, he wrote. The won was Asia’s best-performing currency in the four years to 31 October 2007, soaring 31% to a decade high of 899.60 per dollar. That encouraged companies to buy contracts that lock in an exchange rate or profit from a drop in dollars. South Korea’s banks were the main sellers of the contracts. They borrowed dollars and converted them to won because they also wanted to fix a price for the US currency to limit their exposure. That contributed to an almost tripling of the nation’s external debt due in a year to $176 billion between the end of 2005 and June 30 this year. There’s a more than 50% chance Korean banks won’t be able to find foreign funding, threatening their ability to repay short-term debt, S&P said in a 15 October report. Emerging market countries must still contend with a slowing global economy. IMF’s World Economic Outlook forecast this month that global growth will weaken to 3% in 2009, from 3.9% this year and 5% in 2007. That would mean a world recession under the fund’s definition. “India is still not going to get capital flows when the global liquidity conditions begin to ease," said Ajay Seth, chief general manager of finance at New Delhi-based Maruti Suzuki. The rupee will fall to 49 per dollar again soon, he said. Slowing exports and rising import costs prompted South Korea’s central bank to forecast a $9 billion deficit in its current account this year. Brazil is forecasting a $28.8 billion deficit in the broadest measure of trade. Ian C. Sayson in Manila, Anoop Agrawal in New Delhi, Bomi Lim in Seoul, Andres Martinez in Mexico City, Laura Price in Sao Paulo, Andre Soliani in Brasilia, and Kathleen Hays and Bernice Napach in New York contributed to this story.